After two weeks sailing together you’d expect our skills would be well honed. But two events didn’t go as well as planned on our last day. We left Stomorska after a lie in and very leisurely breakfast, having figured there was no point sitting idly in Trogir’s Seget Marina when we could have been here. Stomorska was easily the loveliest small harbour we had come across – several restaurants and very pretty. Slipping our moorings presented no problems and we were waved off by the very friendly and capable harbour master. 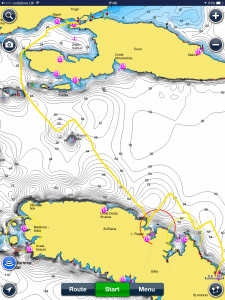 Shortly after leaving the bay we were sails up and engines off beating towards Drvenik Veli where we planned a short anchorage and swimming from the yacht. We realised we hadn’t done a great deal of tacking on this trip but were making good progress in around 18 knots of wind (one reef equivalent in). It occurred to me that returning to the bay we had stopped for on our first day was further than necessary and so I checked charts for something suitable nearby and found the bay of Uvala Kasjun near the town of Rogač. I planned to drop anchor and take one line ashore to hold us steady in the breeze. 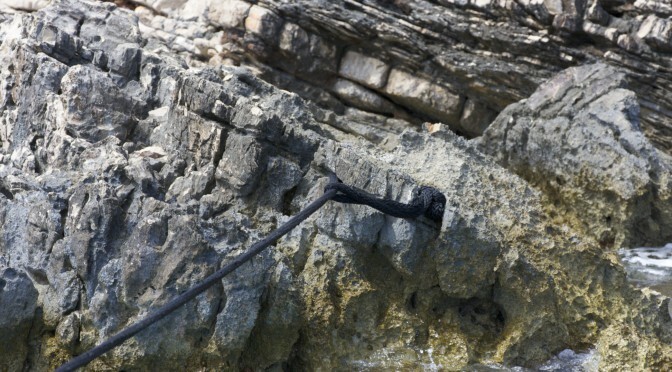 Harry got his rock shoes on and swam towards the rocks. We’ve tended to stick to roles, such as Tom with the anchor and lazy lines, but Harry got a little panicked. 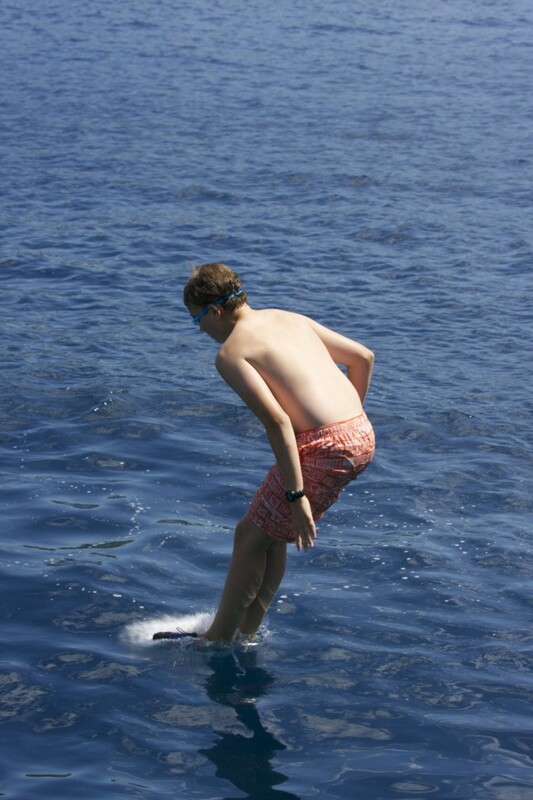 Both he & Joe were paranoid about stepping on sea urchins again so it was on with goggles and checking below the water – that’s what the rock shoes were for. It just wasted time and added pressure. Then climbing up the rocks wasn’t easy – very sharp. He got his foot wedged in between and scraped his knee in the panic. For my part, when the line was set, I moved too fast forward pulling the boat end of the line faster than Helen could hold on to and it was in the water sinking. No option but for Harry to pull it all in and to through it back to us – he was delighted! I reversed back again and got to within 2-3 metres of him paranoid about the depth – we had about 6 metres. This was our worst park by far and there was much swearing – everyone cheered up after jumping from the boat for a swim. The beat back home was again very enjoyable. We came off a close haul just a touch and were making about 7 knots more comfortably (less heeling over) and kept clear of the isolated danger mark (Plicina Mlin) on the way. As we came though the red and green channel markers just south east of Čiovo Island, we bore away onto a beam reach and raced around home. Helen spotted a green marker which was supposed to be on the headland but in fact is well out to sea and we avoided disaster. Refuelling at the ACI marina in Trogir took 90 minutes as we bobbed about avoiding collision with half a dozen other charterers waiting in line. Two boats pushed straight in front, bold as brass, and filled up. Much shouting from us and others at their move. The park back at the home marina needed to be perfect, and should have been with all the practice, since we would be watched by the charter company’s bosuns – so a matter of pride. I opted, against Helen’s advice, to go inside the pontoon reasoning that we’d get a better nights sleep than outside. But the water was a lot more choppy and the nasty crosswind made it my worst park by a long shot (aborted once, and fluked straightening up right at the end). The bow thrusters are essential but they weren’t enough to counter the windage on the bow.